Aruna is the topper in her LL.M and has excelled in academics all through her schooling. She has also qualified the Financial Services Authority Regulatory Environment from SII, London. She has also completed a short term course on Medical Laws. She started her career as an Advocate and practiced in the trial courts and High Court of Karnataka for over 4 years. She has worked with Corporates like 24/7 Customer, HSBC and Consult Genie handling Risk and Compliance profiles. She has won several awards and accolades from both the employers and also the Business Partners. Her teaching career in law started in 2012 with CMR Law School. She is now in charge of the Internship and Placement Committee; and is also the Head of the Department for BB.A, LL.B Course. 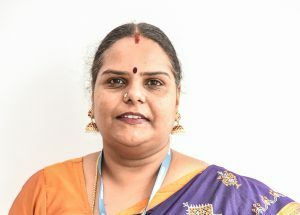 Aruna has attended several International and National Seminars and has presented papers on Gender Justice and Gender Neutrality, Human Rights, Sexual Harassment of Women at Workplace. She has also worked on Corporate Responsibility and Data Protection under the Information Technology Act. Her areas of interest for further research include Digital Forensics and Medical Laws.